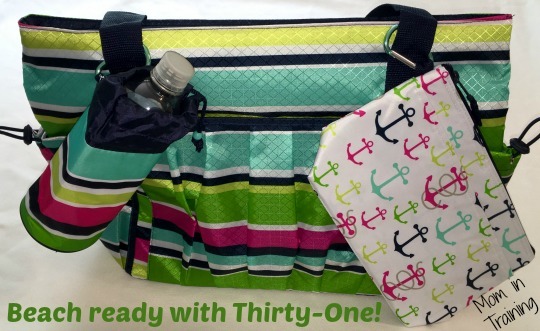 If you've been around my blog for awhile you know about my love of all things Thirty-One. If you're new here let me fill you in. I used to be a Thirty-One consultant several years ago, but then I became a stay at home mom and well...life happened. Needless to say I had to step down to dedicate my time to other obligations, but I never lost the love for their products. Fast forward a bit and now here I am with the great pleasure of sharing my love with you my readers! 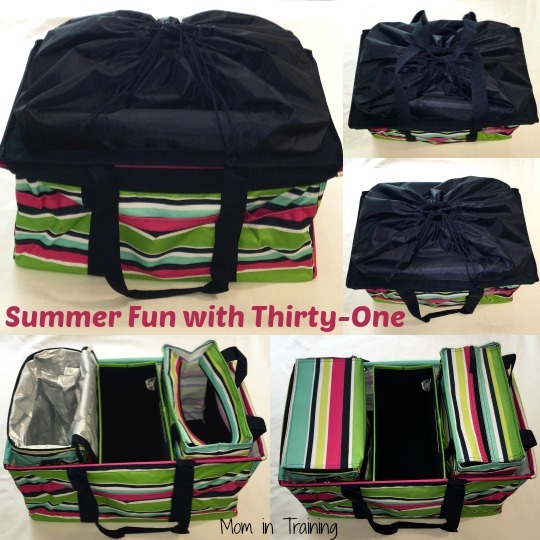 I hope that through my posts you can learn a little bit about Thirty-One and the awesome line of products that they offer so they can help you keep your life organized in style. One of the things I've always liked about Thirty-One is that they have so many products that can be used together. Yes they can all be used at the same time, but many of them can also be combined into larger totes making it easy to organize and tote them around easily. For example in the photo above I started out with the Deluxe Utility Tote (a larger version of their popular Large Utility Tote) and then slid in the Picnic Thermal Tote, Fold N' File, and Tall Organizing Tote inside. To finished it off I topped it with the Deluxe Cinch-Top Lid. This lid is really awesome because it can add up to 12" to the top of your bag! Now when you have lots and lots to take on the go you'll have plenty of room. The other thing I like about Thirty-One is the awesome patterns that they come up with. My latest obsession is their Preppy Pop pattern. I love the bright colors and the way they all blend together so well. Plus they even coordinate well with some of the other patterns like the "First Mate" (shown below). With stylish patterns and an easy way to organize your things heading out to the park or the beach will be super easy this summer for sure! Speaking of the beach here are a few more great products in the Preppy Pop pattern. The New Day Tote is perfect for a day at the beach and when paired up with the Cool Clip Thermal Pouch and the Bring-A-Bottle Thermal you'll have everything you need all together. I love that the pouch and bottle thermal both come with a carabiner clip so you can attach them to other bags making them easy to access. I've always hated having to dig down inside bags to find things so this is perfect. Now I can keep my bottle of water and snacks handy. If you haven't checked out Thirty-One in a while I encourage you to do so because so much has changed over the years. Their spring/summer catalog has some really hot new prints and products I know you'll love. And make sure while you're there you check out their customer specials and hostess rewards. Hosting a party can earn you some exclusive products too. I've never seen them. They are cute and roomy.Nice to take on a trip. They have cute designs. I think this bag looks great for organizing everything! These look great! I love products that improve organization. I like the separated compartments. The color is a little off from my taste!! I love these bags, and love that you can bring along cold foods or hot foods , I also love all the great colors they come in.. I LOVE---and really need---one of the car trunk organizers for my little hatchback. It would make even simple errands a lot easier. Such cute designs, too! That anchor print is so cute. I really like that folding file too. I've purchased a few Thirty-One bags for my wife over the past 6 months or so and she has really used them. Not only are they very useful, the styles are trendy too. I love the Day Tote :) And the Cool Clip Thermal Pouch is so neat! I could really use this for the gym, day trips, etc. I love how these products could bring organization to my life. I love thirty one products. I love the designs that they have, and they look very sturdy too! These packs look as though we could get a lot more organized than we already are. I like the review on these packs. I love these bags! I'd love to have one for a road trip! These bags would be great. They would make summer travel easier. I love this bag for outings to the park or the beach. A great product to keep everything from getting all messy. Oh wow, that bag is huge! I love how its open at the top with all the pockets...awesome! I can think of so many times I would use this! Great bag would be nice to have. This is such a cool and stylish way to get organized! I really like these. I love the patterns. I need to try these bags! Thanks for the post! 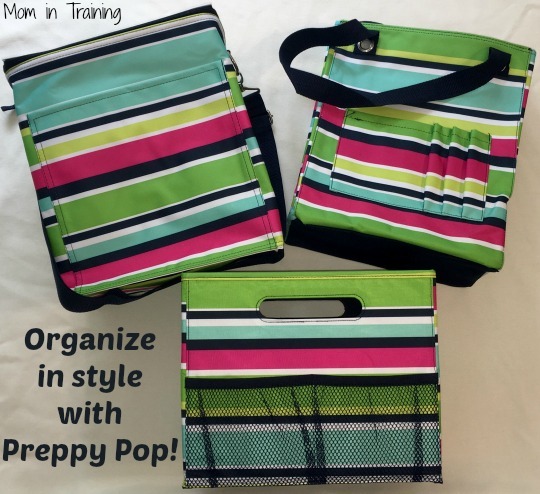 I like the thought of organizing in style this summer with Thirty-One. I like the storage ideas and versatility. I like that these bags are so easy to keep clean, especially if you're taking them to the beach. The organization features are a huge plus.